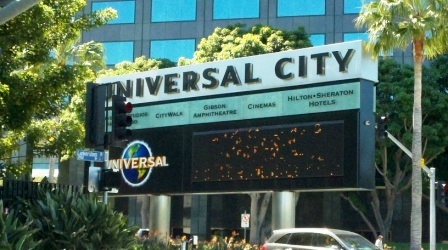 Universal Studios Hollywood includes a full-day, movie-based theme park and Studio Tour, the CityWalk entertainment, shopping and dining complex, the Universal CityWalk Cinemas and the Gibson Amphitheatre concert and special event venue. The theme park features such groundbreaking attractions as "Revenge of the Mummy The Ride," "Shrek 4-D™," "Jurassic Park® The Ride" and the world-renowned Studio Tour, which takes guests behind-the-scenes of such landmark TV and movie locations and sets as Steven Spielberg's "War of the Worlds." There is an upper and lower lot at Universal Studios. The upper lot is where to catch the Studio Tour, Simpsons Ride, Shrek 4D, Curious George water park, Special Effects Stage, WaterWorld, Animal Actors, Terminator 2: 3D, House of Horrors and more. The lower lot is a long series of escalators down to the Jurassic Park water ride and Revenge of the Mummy ride. Universal Studios is great. However, I will say that my 5 and 8 year olds seemed to get antsy here quickly, even with characters like Shrek, Spongebob, Curious George, The Simpsons and Scooby Doo in abundance. The rides are not particularly geared towards young kids. And while the Studio Tour is awesome, but even with the fun sights and narration (and of course Jaws, King Kong, earthquake and othe spectacular effects), at 45 minutes, the ride for some little ones may be a bit long. Just wanted to get that out there...not that you'll necessarily have the same experience as me! Universal CityWalk features 65 entertainment-themed restaurants, nightclubs, shops and dynamic entertainment options. CityWalk alone is plenty of entertainment for the better part of a day. There are 19 theaters, including an 8-story IMAX®. There's indoor skydiving with iFLY Hollywood, Jillian's Hi Life Lanes (bowling and games), Jon Lovitz Comedy Club and more. One thing we did was to purchase a 2 day pass, which allowed us to stay half a day at the park and then hang out on Citywalk. One other word of caution. We visited on December 31, 2010. Big M-I-S-T-A-K-E! It was horrendously crowded and the lines were crazy and packed with out of towners here for the Rose Bowl. So I'd advice against that if you are a local. But our return trip in April was perfectly fine. Lines were not bad at all :> Visit www.universalstudioshollywood.com for more information. The Simpsons Family as popular as ever!